Terms are used to define customer and vendor payments. To access Terms Master Files from the menu bar of the main TeleTracker Online screen, click Master Files, then Terms. To create a new Term, click on New button located on the toolbar. To open an existing Term, select the Term from the Terms Master File list and click the Open button. Code : This field is the unique name used to identify each individual Term. Description : This field is used to further describe your Term code. 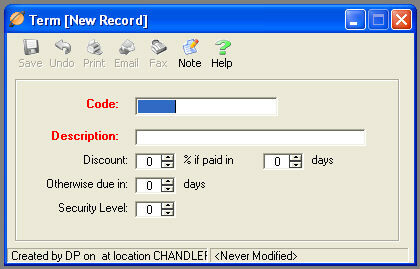 Discount : Look for this functionality in a future TeleTracker Online upgrade! Otherwise Due In : This field specifies the number of days in which the payment is due. This field directly corresponds to the type of Term you are creating. For example, a term code of ‘NET30’ requires the Due Days field to be set to "30". Security Level : This field is used to define the level of security clearance required to apply the specific term to an invoice. The security level defined within your Term will correspond directly with the Security Level defined within the User Master File. Creating Terms will insure the accuracy of your accounts receivable and accounts payable aging reports.